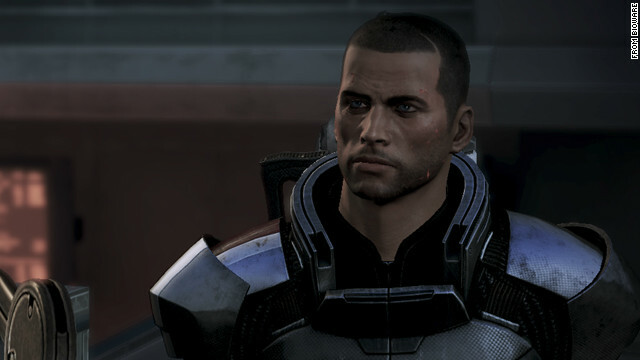 Command Shepard pursues his destiny in popular sci-fi videogame series "Mass Effect 3." Editor's Note: Colette Bennett is CNN Geek Out's main Otaku writer. She has written for several gaming blogs, including Kotaku, Destructoid, Gamasutra, GamesRadar, Touch Arcade and GameSugar. She also runs a personal blog on gaming, which can be found at blowinthegameslot.blogspot.com. Today, the gaming industry was permanently changed by a single step, proving that fans, if they voice enough dissent, have the power to change the ending of a published game. BioWare, a subsidiary of gaming powerhouse publisher EA and creator of the popular "Mass Effect" series, announced today that it will release an "Extended Cut" version of the final installment in the series, "Mass Effect 3." Normally, that wouldn't be news, as downloadable content for released games has become somewhat of an industry standard. However, the voices of displeased fans are what drove this decision. Shortly after its release, people who faithfully played every title in the series started to complain that the ending was a disappointment. The heart of the dissent settled around the sentiment that it strayed from a key feature of the previous installments in the series: that they had challenged players to make carefully crafted decisions that seemed to closely affect the direction each person's game took. But in the end, those decisions were for naught. A recent survey found that 58% of the fans who played "Mass Effect 3" hated the game's conclusion. "It made me, the player, irrelevant," says devoted series fan Ian Hoopes. "I played more than 100 hours of a video game series that went through ups and downs," Hoopes explains. "I developed huge attachments to characters, especially Garrus and Tali, and I valued their feelings and opinions, which I felt were truly developed. In my experience playing the game - over 100 hours spent on "Mass Effect 3" and five additional years of "Mass Effect" gaming - the ending tried to distill the entire journey into three rigid, ambiguous decisions that made me feel left out in the cold."